Joni was born Roberta Joan Anderson in Alberta, Canada in 1943 but at the age of nine, she was caught in a polio epidemic and spent numerous weeks in hospital. Her early aspirations was to be an athlete but that was no longer an option so, being the creative type, she decided on a career in music. She knew what she wanted and wrote and produced all her own material and thus earned the highest respect from her peers, fans and critics alike. Rolling Stone magazine once cited her as ‘one of the greatest songwriters ever’. In 1964 she married Chuck Mitchell and although the marriage only lasted a year, she retained his surname as her professional recording name and after the divorce she relocated to New York. She recorded her eponymous debut album in 1968 which was produced by then-boyfriend David Crosby. The following year she was set to attend the Woodstock Festival but on the advice of David Geffen, pulled out and, instead, wrote a song about what she thought it would have been like. Later the same year she released her second album, Clouds, which featured the luscious Chelsea Morning (the one in New York not London) which although released as a single failed to chart on both sides of the Atlantic. However, a faithful cover by Neil Diamond was the second song played (after Bridge over Troubled Water) on the newly launched Capital Radio in 1973 and, in 1980, Bill and Hilary Clinton named their only child after that song. 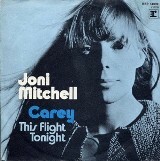 What did Joni make of the rocked-up version? Agnew explained, “When she was recording at A&M, we were just starting an American tour, we all happened to be in the studio the day the single was released, so we were introduced to her and told her what we had done. She said, ‘What, with a rock band?’ When she heard it, she loved it.” Once the song had made the UK chart, where it peaked at number 11, Joni paid the band a wonderful compliment. “She was playing a gig in London and told the audience: ‘I’d like to open with a Nazareth song’!” remembered Agnew. Mitchell continued churning out albums in the 70s and 80s and was the darling of the west coast music scene but behind the music this lady had to live with the torment of giving her daughter up for adoption. Joni was generally a private person but in 2013 she revealed many things in the book, In Her Own Words Conversations with Malka Marom, where Joni talks about her lifelong battle with chronic illness, the pain of the adoption and paranoia. She explained how she’s become forgetful and suffers from Morgellons, a rare, mysterious and controversial disease that attacks the nervous system that makes sufferers feel like there are parasites living under the skin. She said it left her unable to leave the house, walk or wear any clothes for excruciatingly long periods of time. She also talks about her fear of the dark because she had so many stalkers lurking around the Laurel Canyon home where she moved to after Judy Collins had a hit with Both Sides Now. Joni was reunited with her long-lost daughter, Kilauren Gibb in 1997. “I’ve had pain and joy in my life but nothing like this, it’s an unparalleled emotional feeling,” is how Joni described the reunion. Kilauren added, “It was wonderful. It was a great relief to me in every way. It made me feel whole. It made me feel complete. I don’t have any expectations. I didn’t come into this thing with expectations. I just wanted to find my mom.” Sadly the reunion did last long, in January, 2000, Joni allegedly slapped Kilauren during an argument in which police were called but Kilauren refused to press charges. In has since transpired that they were incompatible. Despite her obvious disaffection, Joni looks back at all the agony and the ecstasy and has said, “I would not change anything. I would do it all over again”. As for Nazareth, they are still touring and still play the song, loud and proud, “It’s our finishing number,” exclaimed McCafferty.